Persistent neck pain can be really frustrating but it’s very common. One of the main issues is that neck pain can be triggered quite easily. You can have the best treatment and exercise program in the world, but if you inadvertently trigger it day after day, it simply will not get better. This goal of this blog post is to help identify some common triggers of neck pain. If you can identify the main triggers, you will get to the root cause of the problem and reduce the likelihood of getting a flare-up. Studies have shown around 65% of us will experience an episode of neck pain every year. Once you’ve had an episode of neck pain, it’s common (about 50% the time) to experience further flare-ups down the track. For some people, the pain can last a few weeks and is only a minor inconvenience. For others though, the pain can last many months and develop into a chronic pain cycle of pain, weakness and fear of ongoing damage. If you’ve had ongoing neck pain for sometime, you will need to get a check-up with your GP or Physio to rule out red flags. Ideally, the neck is highly mobile that allows us to see in all directions. Evolutionary speaking, if we are unable to see potential dangers around us, our nervous system goes into a strong protective response. Some of the neck pain you feel may be related to this increased nervous system sensitivity. It’s important to be aware of this extra sensitivity, otherwise you will mistake the pain for ongoing tissue damage. Left unchecked, these ongoing negative thoughts about the body can do much harm in the form of fear, avoidance of movement and increased anxiety and depression. If you have ongoing neck pain and you’ve been assessed by a Physio / Doctor and found to have no red flags or structural issues, it’s important to understand that most neck pain is coming from the muscles. The neck is designed for movement and is made up of 44 muscles which help control movement of the head. When the muscles become overloaded, they become tight and reduced movement results. Lack of movement means the muscles have a reduced blood and oxygen supply. If the muscles continues to get overloaded for long enough, the muscle fibres form a trigger point / knot that can cause ongoing pain. 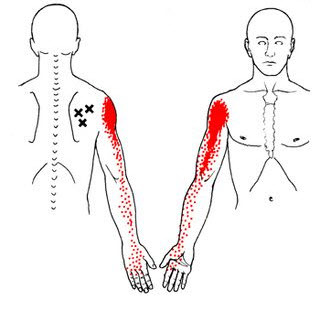 Each muscle has a typical referral pattern, where the pain spreads into a different part of the body (see picture below of the common trigger point in the upper traps). 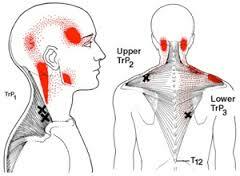 The most common trigger point in the Upper Trapezius muscle that refers up to the temple and behind the eyes. If you’ve had x-rays or a CT/MRI of your neck, it most likely picked up some findings in the neck such as disc bulges, degeneration and spurring. Whilst these things can definitely trigger off a pain response initially, it is unlikely to be the major cause of ongoing pain. Many people have these changes on scans, but most people have minimal or no pain (see table below). The majority of the degenerative features are likely part of normal aging process and unassociated with pain. As you can see in the study below, disk degeneration is present in 68% of 40 year olds who are completely asymptomatic. As you get older, the chance of having a disc bulge around 70% by the age of 60. Once again, this is in a group of people who don’t have any pain. Be careful who you listen to in terms of how you’re scan results are being interpreted. Lifting heavier things that you’re used to can cause overload of your neck muscles and joints. This might be at the gym, carrying groceries in from the car or lifting young children. Just to clarify, you can still lift heavy things, especially if you have a good capacity built up gradually over the years. It’s just best to avoid carrying heavy things that you are not accustomed to. So take care in the gym, and know your limitations. If you need to, have some sessions with a trainer who who help show you the right technique. I know it’s a hassle, but take a bit of extra time to make a couple of trips (or ask someone to help) to carry your groceries. It can make a world of difference to the health of your neck. One thing the neck hates is being is locked in one position for than 20 minutes at a time. Holding sustained positions for long periods of time tends to increase the tightness in muscles such as the upper trapezius (top of your shoulder) and sub-occipital muscles (base of your skull). The most common sustained position is from looking down at your phone constantly. We know (from the picture above) that the further down you look, the bigger the strain on your neck (up to 30kg of pressure when looking right down). Our necks are simply not designed for this. Make sure to bring your phone up to eye level, otherwise you will place considerable strain on your neck muscles. A key point to keep in mind, is there is no one perfect posture. Don't get fooled into thinking you have to always have a perfectly upright posture all the time. Some people who follow this line of thinking get very anxious if they don’t have perfect posture. This anxiety can further increase the muscle tension and pain in the neck. “The best posture is your next posture”. Meaning that you need to keep yourself moving and changing positions frequently. If much of your work is based around a computer, a sit to stand desk would be a very good investment. Test your breathing patterns. Place one hand on your upper chest and one hand lower. Take 3 deep breaths and notice which hands lifts up first. We take approx. 21,000 breaths per day. Each one sending a message to your nervous system - either a message of 'safety' or 'danger', depending on the pattern. Habitual shallow breathing and subconscious holding of the breath can maintain a sympathetic (fight/flight) dominant state. This is common in people who have neck pain - and they tend to breathe more using the upper chest muscles. These are known as the accessory breathing muscles. These accessory breathing muscles are the scalenes, sternocleidomastoid, pecs and lats that attach from the ribs to the spine. If they are constantly working through upper chest breathing, they become overly tight and can cause the neck to become tight and painful. Learning how to breathe efficiently through the diaphragm is the foundation of optimal movement and recovery. Take your hands around the bottom of your rib cage and as you breathe in expand outwards, like you’re trying to blow up a balloon. Feel your lower ribs expand from the front, back and sides - that is your diaphragm muscle. If you’re feeling a lot of neck pain, try taking 5 deep breaths into your diaphragm. Breathe in for 5 seconds and then out for 5 seconds. Keep your upper chest and shoulders relaxed. “As you become more mindful of your breathing, you will find you become more present, gather all your scattered aspects back into yourself and become whole”. ~ Sogyal Rinpoche. Aside from injuries and poor posture, stress also plays a big role in ongoing neck issues. When we get stressed, the 'fight or flight' system is activated in our bodies, sending messages to our muscles to contract. 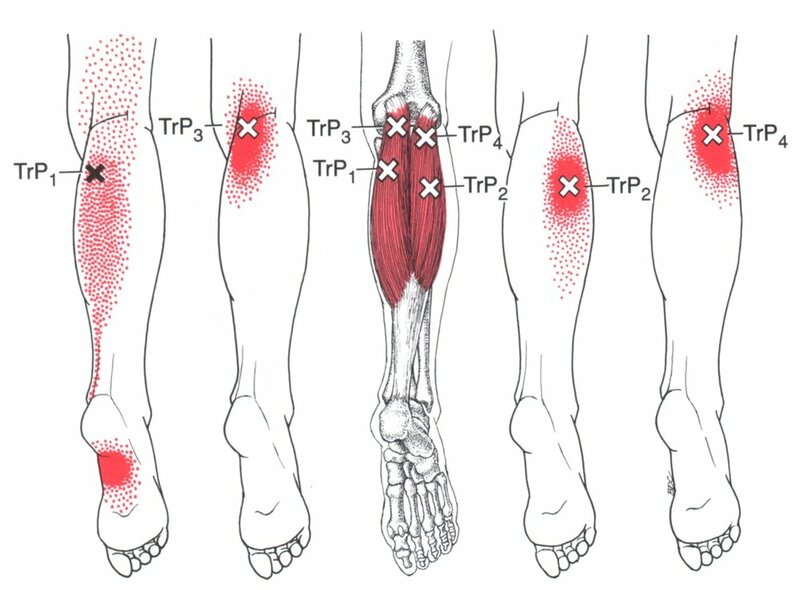 As this muscle tension becomes chronic, the tightness reduces our flexibility and produces pain. If you are feeling anxious or stressed in other areas of your life, this can increase the sensitivity of your nervous system. Like a magnifying glass, it amplifies the sensation you feel. If you have a lot of underlying stress in your life, sometimes a minor twinge in your neck can be perceived as extremely painful. 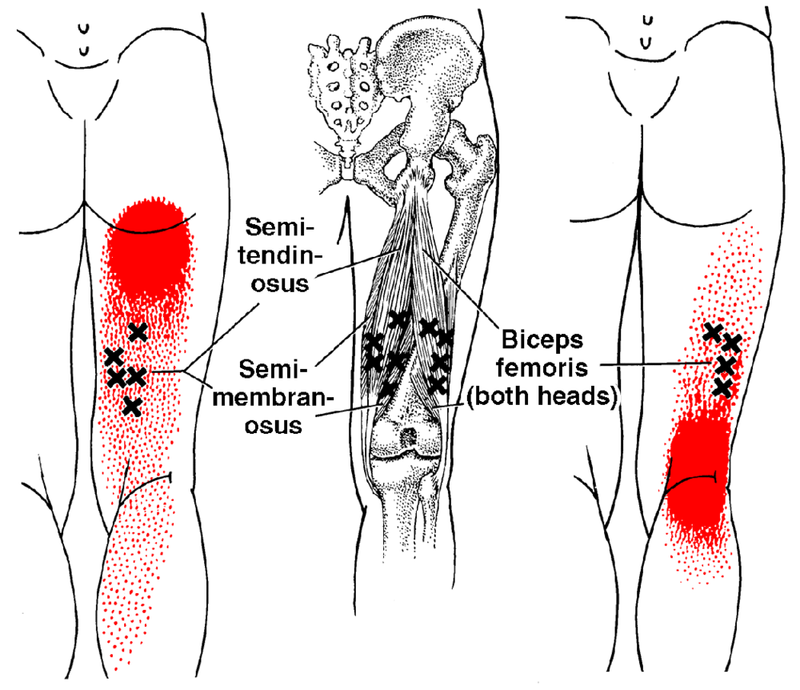 Your capacity for dealing with muscular tension issues can be dramatically reduced. The way to move forwards from this is to take note of all your stressors and try and address them as best as you can. Very often some support from a qualified psychologist can be extremely helpful and you could speak to your GP about getting a referral. It's important to invest in a good mattress and pillow, as we spend one third of our lives in bed. Finding the right pillow is a very individual process so you may need to experiment with a few different types in order to find the one that fits you best. Check the distance between the side of your neck and your shoulder. That gives you an idea of the pillow height you need to keep your head and neck supported when you sleep on your side. If you’re burning the candle at both ends, you can’t expect your body to be able to re-charge and perform optimally. wake up early (no later than 6am) and get moving by exercising for 45 -60 minutes. Find an exercise that you can do that increases your heart rate without stressing your body too much. It might be swimming, hiking or jogging. Physio treatment of neck pain - what works? Our approach is to resolve acute neck pain quickly and return to doing what you enjoy, but we also have a focus on getting to the root cause of the problem and limit recurrence. Exercise is beneficial in people with neck pain. There is good evidence to show that exercise and building capacity is the best approach to helping reduce neck pain in the long-term. 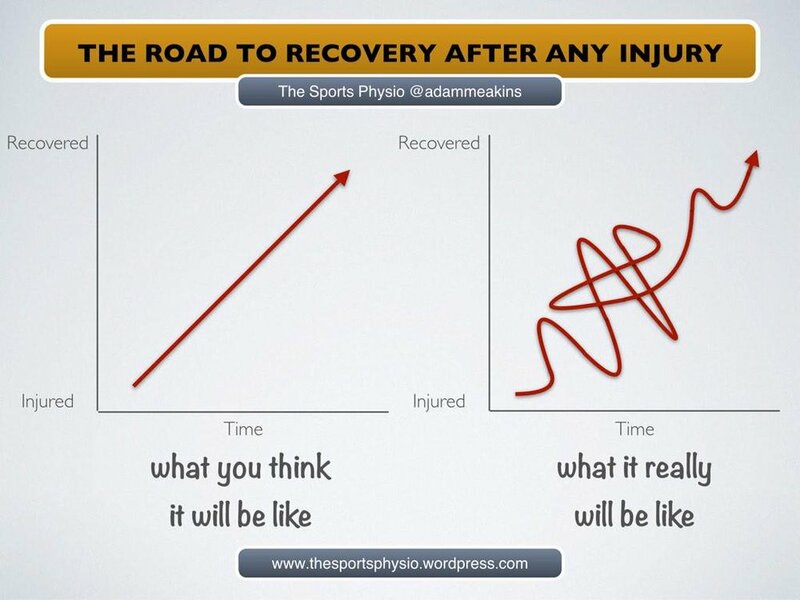 The best exercise is based on our personalised assessment with a Physiotherapist. A comprehensive program will involve a combination of stretching, strengthening and improving joint mobility. Some PDF of some common neck stretches we prescribe can be downloaded for free here. 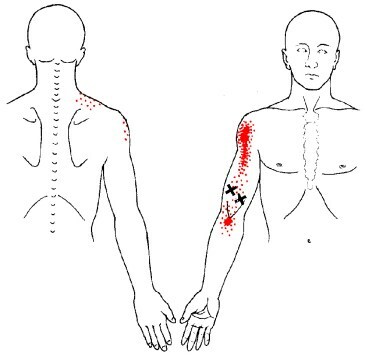 This study recommended dry needling for immediate pain reduction in upper body myofascial trigger point dysfunction. It certainly can be quite intense and can take a few days to work itself out, but we find dry needing to get the most effective release of the muscles. Using heat on the neck via a wheat pack is really helpful, especially in the evening before bed. In an ideal world, pain would get better progressively step by step. Reality though can be very different, and more often than not, we see a two step forward, one step back sort of pattern (or a bit more dramatic as in the picture below). The thing to keep in mind is staying positive, (and it can help to lower your expectations a little). Life can easily get in the way of stopping you from doing what you need to do to get better. If you’re really committed to overcoming your neck pain, make getting better a priority in your life, (for at least for a 3 month period). Often that is about the right amount of time to significantly build your foundation and capacity. With the right management plan in place, neck pain is very manageable. If you’ve had neck pain for a long term, we expect there will always be some ups and downs. But overall you should be very hopeful of making a significant recovery and getting back to enjoying life again. If you’re after some more personalised advice and treatment for your neck and you wish to get some relief right away, use our simple online booking system to make an appointment.